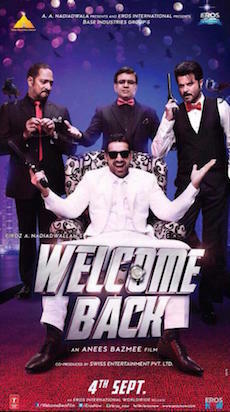 An action comedy directed by Anees Bazmee. Produced by Firoz Nadiadwala. I played Ajju Bhai, a loveable Mumbai goon. A sequel to the smash hit comedy Welcome, this continues the adventures of Uday Shetty and Majnu Bhai as they try to find a suitable husband for yet another sister they didn't know they had, while also dealing with their own love lives. "I thoroughly enjoy comedy. I loved doing Welcome Back and I make no bones about it. Anees is probably the best comedy writer we have in this country. It was a real honour working with actors of such high calibre and superb comic timing as Anil Kapoor, Nana Patekar and Paresh Rawal."